vitum medicinus ::: a life of medicine: The best part of spending two weeks with medevac? Not what you might think. The best part of spending two weeks with medevac? Not what you might think. As my third year was winding down last month, I had the opportunity to do a two-week elective in anything I wanted. Supposedly it had to be medically-related, but given that some of my classmates were approved for two weeks of wakeboarding or a 3-hour first aid course*, spending two weeks in paramedicine made me look like an overachiever. The elective was pretty incredible from a medical point of view. Among the dozens of calls we attended, we picked up a young lady whose ATV had gotten away from her, crushing her leg to the point where she might never walk again. We also treated a few patients who had fallen off ladders or nearly drowned, and a nailgun injury. As well, there was a variety of medical patients too complex for the rural hospitals who needed to be brought to the big city for super-specialized care. There were things that I didn't anticipate. There were heart-wrenching moments, like talking to one of our patients, a young lady who had been poisioned by carbon monoxide...intentionally. Sadly, she was not the only suicide survivor that we saw during my two weeks. As well, we went to a few car accident scenes and I saw some things, tragic things, that I wish I hadn't. One thing about the elective really surprised me. Those of you who have read this blog for a while might remember that I have shadowed flight paramedics in the past. Back then, it was fascinating for me to see what the paramedics did...treat and transport the sickest patients in the province. What surprised me is that this year, my time with the paramedics served as a stunning eye-opener, revealing to me how little I knew about not only paramedicine, but medicine in general back then. In other words, until I had completed my third year of medical school, I had no comprehension of just how sick the patients were that we were transporting. Not only that, but I had no idea the elite level of training of the flight paramedics. Back then, I did not understand the skill demanded when handling ventilator settings for patients with severe lung disease, or the implications and specialization required in order to keep alive a patient with bacterial infection coursing through their entire body. I only now realized just how sick these patients were, having been involved in identifying and treating sick patients myself, and also that some of the drugs that the paramedics were trained to prescribe are typically only used by intensive care specialists. It was exciting to be able to understand at a deeper level the diseases affecting our patients, and to be able to have a new level of conversation with the flight paramedics, actually discussing treatment options with them. To put it another way, before I had completed three years of medical school, I didn't even know what questions to ask. Needless to say, my understanding of the complexity of the patients and the difficulty of their management gave me a new level of respect for the critical care flight paramedics. Retrospect, for me, is a valuable, meaningful experience. In fact, one of the reasons I started this blog was so I could look back and see how far I've come; in a program that is years in length and where you rarely realize how much you have learned from day to day, sometimes looking back is the only time you'll realize how much you are learning. It was a huge privilege to be invited back to spend time with these highly-trained paramedics, and it was a great surprise to discover that without realizing it, I had signed up for two weeks of seeing how much I have learned. Glad the $45,000 I've spent so far on tuition seems to be paying for something! It seems like you had a fantastic experience. I remember when I had a chance to fly with the medevac equivalent in our state at the end of the first year of medical school - I was immediately impressed by the high quality of training the flight staff had had! I'll have to keep Airevac in mind for my electives. I work for BCAS and tagged along with 280 before starting med school. No scene calls that day unfortunately. 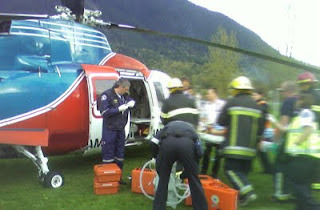 We did pick up one pelvic # s/p paragliding accident from Chilliwack Hospital, though. Vitum, I just realized I never added you to my blogroll... terrible oversight on my part. Just pruned most of my links and realized you weren't on 'em. Sorry man, I've been enjoying the blog for a long time. Spent 6 months overseas working as an ICU medic... best 6 months of my life. Good luck with 4th year!